"Taking your packages to new heights." The Mombasa Tether, also known as the Mombasa Space Tether or the New Mombasa Orbital Elevator, was a space elevator located at the heart of the East African Protectorate city of New Mombasa on Earth. It was used for lifting heavy ordnance from the surrounding port facilities into a station in geosynchronous orbit at the top of the elevator structure, a transport method much cheaper and more efficient than booster rockets filled with expensive fuel. The company in charge of the management of the space elevator was called New Mombasa Uplift. The elevator as viewed from Old Mombasa; the Solemn Penance holds position during the city's occupation. "It collapsed when the city got glassed." "But the tether was thousands of kilometers high..."
"Yeah? Well now it's scattered all over the Savannah." — Two Marines discussing the fate of the space elevator. In 2302, Mombasa was chosen to be the Earth's first tether city. As a cheap gateway to space, the elevator is the key to New Mombasa's economic and strategic importance. The presence of the elevator radically changed the structure of the city - service roads and a MagLev train line radiate out from its base, connecting it to nearby warehouses and factories. The elevator's base resides on an artificial island full of warehouses and docking facilities, to provide more docking space for incoming cargo vessels. And it was this influx of business and trade brought in by the elevator that made New Mombasa the metropolis it was by the time of the Covenant invasion. The elevator's support structure, engulfed by the aftereffects of the Slipspace rupture. During the Battle of Mombasa, the Mombasa Tether was shut down. When the Prophet of Regret retreated, his flagship, Solemn Penance, initiated slipspace transition over the city, right beside the orbital elevator. The resulting shockwave swept through the structure, weakening it considerably. Under an hour later on the same day, the damage from the Slipspace rupture was too much for the support structure to handle. It exploded at multiple points, and the tether snapped at some two kilometers above the surface. The upper portion of the tether was instantly pulled upward by its orbital counterweight, now severed from the groundside anchor point. The lower section collapsed, leaving only a small portion of the lower support structure intact, even though heavily damaged. Several pieces of debris crashed around the city and the surrounding area, while more fallout presumably caused considerable damage to buildings near the tether. A large portion of the tower's debris was left scattered around Earth's surface, while most of the tether was pulled into space, likely ending up in an unstable orbit around Earth. While the upper portion of the tower was slowly pulled up into space, debris such as support rings and cables rained down to the surface far as the town of Voi and its surrounding regions, leaving large areas littered with debris and damaging infrastructure, such as the Tsavo Highway. After the end of the Human-Covenant War on March, 2553, some debris from the elevator still remained in the area near Voi. The Mombasa Tether as seen during the Halo 2 campaign, with the Solemn Penance holding position nearby. 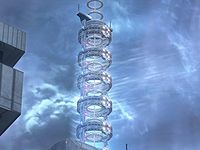 In Halo 2, the space elevator is visible throughout all the Earth levels, first as a thin line on the horizon in Outskirts, then later as a ringed tower in the skyline of Metropolis. Only at the end of that level is the player offered an unobstructed view of the structure from across the artificial canal. At the end of the campaign level Metropolis, the flagship of the Prophet of Regret flees into slipspace with the In Amber Clad in hot pursuit. This in-atmosphere jump unleashes a wave of energy that scours the area. Originally this was thought to collapse the tower, but as seen in Halo 3: ODST, this wasn't the case. Shattered rings from the elevator seen on Tsavo Highway. 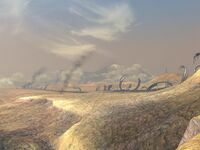 The elevator was not seen again until the Halo 3 Announcement Trailer, in which several of its stabilizer rings lay shattered in the background hills. 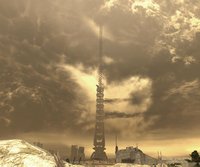 Concept art from the Halo 3 Zune confirmed that the wreckage of the space elevator would play an important part in the design of the Earth levels. The elevator did make an appearance in the final game, with the player fighting through its ruins throughout the level Tsavo Highway and even hearing some dialogue concerning its fate from Marine allies. The tether following the slipspace event. In Halo 3: ODST, the Mombasa Tether plays its most prominent role. 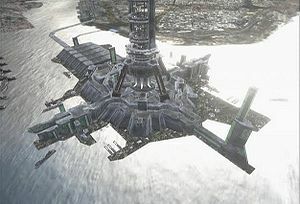 The structure has been reimagined from its Halo 2 incarnation; its base is located on an artificial island west of the city center, with MagLev Train lines leading to it, instead of the center of the Mombasa island in Halo 2. Its general appearance has also been changed, with a different, near-symmetrical base structure, and an additional support structure surrounding the lower part of the tether. While it was originally thought that the elevator collapsed instantly when the Slipspace rupture shook it apart, it was first revealed in the "Keep it Clean" teaser that the elevator did not in fact collapse instantly. In the game, the player is able to witness the actual failure and collapse of the elevator during the level Uplift Reserve, played from the perspective of Corporal Taylor "Dutch" Miles. The wreckage of the elevator can be seen throughout the levels of the game, with its debris scattered around the city and the ocean. The space elevator island after the tether's collapse. When the elevator snaps, the upper half is sucked into space, while the lower half, as well as some debris from the upper half, is scattered across the landscape. Some original concepts show that the tether was supposed to simply fall to the ground in its entirety. This was likely changed for realism, as if a space elevator was to be cut at its anchor point on Earth's surface, the outward force exerted by the counterweight would cause the entire elevator to rise upward into an unstable orbit. It is, however apparent, that this was taken into account already in Halo 3, as the main tether itself is not seen among the debris, which mainly includes support rings and cables, indicating that the support structures around the tether fell to the ground as the majority of the tower was pulled upward. 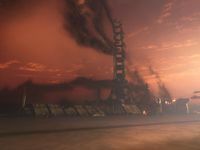 Several maps of New Mombasa seen during the Audio Logs in Halo 3: ODST show the Mag-Lev lines from the space elevator's base leading to the Mombasa island. However, as seen in-game as well as several other maps, the train lines lead only to the mainland north of the elevator. During the level Tsavo Highway in Halo 3, when two marines have a brief dialogue about the fate of the elevator, they erroneously refer to it having collapsed when the city was glassed. As seen in Halo 3: ODST, it collapsed well before the glassing of the city, due to its structure weakening from the Slipspace rupture. This may be a mistake on Bungie's part, the marines may have been misinformed of the cause of the destruction, or it may be being used in a colloquial manner to refer to the extensive damage caused by Regret's slipspace jump. In the Halo 2: Anniversary multiplayer map Stonetown, a space tether remarkably similar to New Mombasa's can be viewed in the map's vista. However, the space tether appears to be under construction, and the city as a whole is nowhere near as built up as it is seen in Halo 2 and Halo 3: ODST. Barring considerable liberties with geography, the tether seen on the map cannot be the New Mombasa's, as Zanzibar Island is over a hundred kilometers away from the city. However, given the tether's apparent incomplete status, it is more likely that the map is set in the post-war period and depicts a new space elevator constructed further away from the East African coast, close enough to be clearly visible from Zanzibar. Early concept art of the orbital elevator for Halo 2. The elevator's stabilizer rings lie shattered on the Savannah in this concept art for Tsavo Highway. More concept art of the elevator stabilizer rings shattered on the savannah. One of the tower's stabilizer rings lays damaged near Tsavo Highway. Concept art of the damaged space elevator in Halo 3: ODST. Concept art of the orbital elevator for Halo 3: ODST. The New Mombasa Orbital Elevator in Halo 2, as seen in a 3D model viewer. The tower as seen from Old Mombasa in Halo 2. A portion of the tether in low Earth orbit. The orbital elevator at the moment of collapse, with pieces breaking off and falling. After being cut, the elevator's cable is pulled into space, while scattering its stabilizer rings across the landscape. The Mombasa Tether in Halo: Spartan Strike. An ad for New Mombasa Uplift, with the tether in its logo. Concept art of Mombasa's tether in Halo 2: Anniversary.